NEW HAVEN — A number of students at New Haven Elementary School are on a new journey, although they are not even leaving the building. “Journey of Hope” is an emotional support program for children started at the school this year, and it has seen great success, according to the leaders. Counselor Dee Ingels and Nurse Samantha Knapp have already completed the eight-week program with 42 students, broken up into five groups. The two have now started a second round of four groups, totaling 37 students, in grades three through six. The goals of the program are to build trust, understand reactions to stress and enhance coping skills, identify strengths and assets, and plan for future actions and behaviors. Students in the program are often referred by teachers, and are diverse groups with a variety of backgrounds, who have exhibited either positive or negative reactions to situations. A book is read to the group each session that goes with the lesson. Some hard topics for children are tackled, such as fear, anxiety, sadness, anger and aggression, bullying, and self-esteem. The sessions also include expression through activities, art, and writing. There are four rules that each group must obey: one voice at a time; keep hands to yourself; confidentiality; and respect. Ingels said the students really like the idea of confidentiality, knowing what they confide will not leave the group. Ingels and Knapp also join in as group members, not school counselor and nurse, and are known there simply as Dee and Samantha. They share their fears and anxieties, as well. 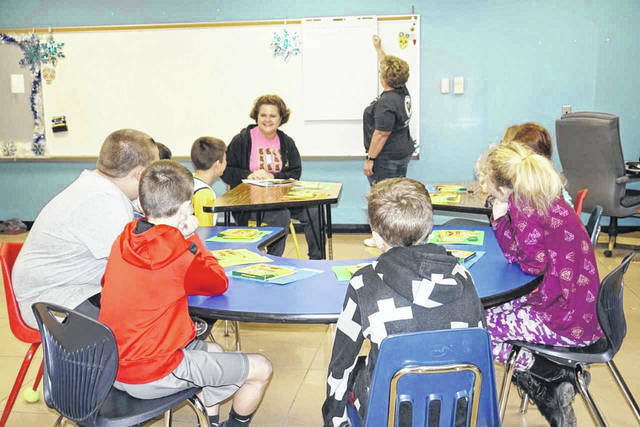 Both said they were very pleased when school resumed after a recent break, and a few of the students were excited to share they had been able to use their newfound positive strategies at home with parents and siblings. One sixth grade student, who completed the first round of the program, said it taught her to trust kids she didn’t think she could trust, and who she normally would not have shared things with. Each students is given a folder at the beginning of the program, and each week all art and written expressions, as well as tip sheets go into it. Once the program is completed, the students are able to take their folders with them. A parent whose child completed the first program said she was thankful that it taught her child healthier ways to deal with stress and fears. “It encouraged my child to talk to students she normally wouldn’t have, grow closer to them, and share with students outside of her regular friendship circle,” the parent added. Ingels and Knapp said they are already making plans to continue the program next year, and presently have children asking when they get to join in. Students are only permitted to participate after parent consent. Journey of Hope was originally started by school and mental health professionals after Hurricanes Katrina and Rita, and allowed children to cope with the traumatic events. School officials have since found the program works on smaller scales, as well as large community tragedies.